On Saturday, Scott stayed home with Otis, and I took Archie and Hugo to a 5th birthday party. At the party there were games for the kids to play, and while the boys joined in with some of them, they didn’t want to give sack races a go. I encouraged them, but they weren’t into it. Their lack of interest in itself wasn’t a problem, until there was a prize given out to all the kiddies who’d been in the race. And remember, Archie had not raced. Hugo had not raced. You can probably see where this is going….. In that moment, I was really torn. Go with option A; “you didn’t participate, therefore you don’t get the prize”, and dealing with the inevitable behaviour that followed. Or option B, flagging the moral high ground, and allowing them to have something that they didn’t deserve. I think these are situations that there’s no training for. And it’s made a whole lot harder when there are 30+ people around, watching what you do. I went with option A. And it went about as well as you’d imagine. And all that went down after Archie had already had a little sit down for allegedly hitting another child. But fast forward 12+ hours later, and it was a new day, with a new set of circumstances. 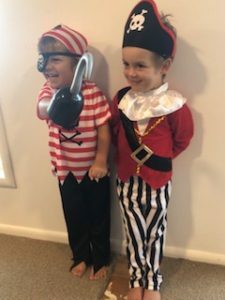 We were again off to a birthday party but this one was in Inglewood so not only did the boys have the excitement of another party to attend, they also had to handle 2¼ hours in the car, each way. It’s fair to say, I was a little apprehensive. But I didn’t need to be. Today has been bliss. I’ve heard Archie and Hugo taking turns nicely, helping each other on the playground, and offering to get each other a drink. They’ve been kind to one another, and to other children. A lady even said to me “those boys are a real credit to you Kylie”. I almost cried. It’s so hard to get this parenting gig right. There’s no guide book to follow, no course to do, and no qualification to work towards. All I can do is try to be their “best mummy”, and gosh I know I don’t get it right all the time.